Governor Palin endorsed Cecile Bledsoe, who is running in Arkansas’ Third Congressional District, via a brief Facebook Note posted today, June 3, 2010. Ms. Bledsoe is a Reagan Conservative. 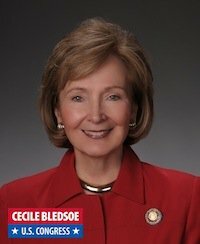 Just had a great talk with Cecile Bledsoe (and talk about “boots on the ground” in her grassroots campaign, she answered her own campaign phone when I called). She’s an inspiring individual whom I’m happy to support. Cecile is another Commonsense Conservative “mama grizzly” running for Congress this year. Her mission to protect our great country’s freedom is so commendable. Cecile is a pro-family, pro-2nd Amendment, fiscal conservative who will work hard for the people in Arkansas’ 3rd Congressional District. Please join me in supporting another member of the “pink elephant stampede” of Commonsense Constitutional Conservative women who will take this country back to our roots of limited government and fiscal responsibility. Please vote for Cecile on Tuesday, June 8th. You can visit Cecile’s website here, and follow her on Facebook and Twitter. 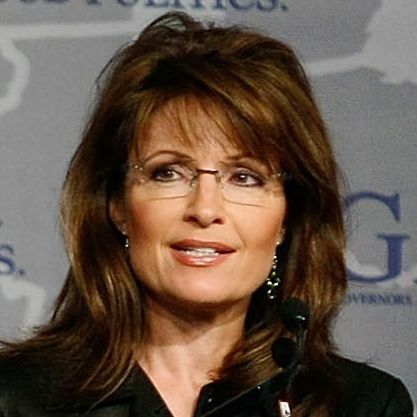 On June 1, US for Palin ran Gov. Palin’s Facebook Note about this Flotilla with a brief analysis. These videos – special thanks to Henry’s Mom of Team Sarah and Smart Girl Politics for providing the lead – prove beyond the shadow of a doubt that these were no “peace activists” but rather low-grade weapons smugglers supporting Hamas terrorists. The original Note and analysis is re-printed below. Gov. Palin today, June 3, 2010 endorsed Terry Branstad for Governor of Iowa in a brief Facebook Note. 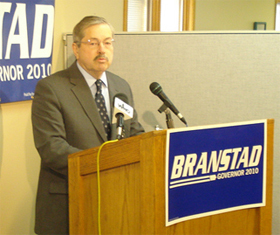 Terry Branstad is the incumbent Governor of Iowa. Please join me in supporting Governor Branstad’s campaign. Visit his website here, and follow him on Facebook and Twitter. No one credible disputes Sarah Palin’s expertise on energy. This woman knows what she is talking about here. The radical left has a diabolical scheme, but it has little to do with a clean environment, and a lot to do with destroying America, and lining it’s pockets in the process. Extreme Enviros: Drill, Baby, Drill in ANWR – Now Do You Get It? This is a message to extreme “environmentalists” who hypocritically protest domestic energy production offshore and onshore. There is nothing “clean and green” about your efforts. Look, here’s the deal: when you lock up our land, you outsource jobs and opportunity away from America and into foreign countries that are making us beholden to them. Some of these countries don’t like America. Some of these countries don’t care for planet earth like we do – as evidenced by our stricter environmental standards. With your nonsensical efforts to lock up safer drilling areas, all you’re doing is outsourcing energy development, which makes us more controlled by foreign countries, less safe, and less prosperous on a dirtier planet. Your hypocrisy is showing. You’re not preventing environmental hazards; you’re outsourcing them and making drilling more dangerous. We need permission to drill in safer areas, including the uninhabited arctic land of ANWR. It takes just a tiny footprint – equivalent to the size of LA’s airport – to tap America’s rich and plentiful oil and gas up north. ANWR’s drilling footprint is like a postage stamp on a football field. “Federal agencies are also now blocking oil development in the National Petroleum Reserve—Alaska. Although familiar with ANWR, most Americans are less likely to know about NPR-A and how vital it is to our energy security. Given recent developments, it’s time to elevate the position this area holds in our national discourse. NPR-A, a 23 million acre stretch of Alaska’s North Slope, was set aside by President Warren Harding in 1923 for the specific purpose of supplying our country and military with oil and gas. Since 1976 it has been administered by the Department of the Interior, and since 1980 it has been theoretically open for development. The most recent estimates indicate that it holds 12 billion barrels of oil and 73 trillion cubic feet of natural gas. In addition to containing enormous hydrocarbons, NPR-A is very close to the Trans-Alaska Pipeline, which means that there would be relatively little additional infrastructure needed to bring this new oil to our domestic market. For more than five years, the state of Alaska has worked closely with major energy companies, local communities and Alaska Native corporations and tribes on a balanced development plan. To back this project, these entities have formed a rare coalition and made significant compromises, often at the behest of the U.S. Army Corps of Engineers, to clear regulatory hurdles for development on a site in NPR-A known as CD-5. But this February the Corps reversed course and denied the issuance of a critical permit for CD-5. Specifically, the Corps denied ConocoPhillips’s request to build a bridge over a river to accommodate a pipeline and vehicles that can access the company’s existing production facilities at the nearby Alpine field. The Corps decreed that the bridge shouldn’t be built and that the pipeline should proceed under water, a course of action that would significantly undermine the economics of the project while posing a greater risk to the environment. Alaska stands ready to help move the nation closer to energy independence, and it’s a shame that the federal government is standing in the way. The Corps’s own regulations emphasize that state and local governments have primary responsibility for land-use decisions and that their views should be given due consideration. But not only has the Corps rejected a critical permit, it did so without consideration of our concerns—on the overly technical grounds that the state’s comments were not made under my signature and that my oral comments to Corps officials were not in writing. The state of Alaska is seeking to join an administrative appeal of this misguided federal decision. If we are not satisfied with the outcome of this proceeding, we will pursue other means, including suing the federal government to ensure that it abides by its own regulations and does not make arbitrary and capricious decisions at the expense of state sovereignty and wise energy policy. America, particularly in Alaska, has vast reserves of onshore and offshore oil and gas. The crisis in the Gulf should not be used to implement a misguided strategy that shuts down the opportunities to develop these resources and that further endangers our nation’s long-term energy security. I for one am glad to see Sarah come out swinging here. The radical Marxist-progressives hijacked the so-called “green movement” decades ago, and are using it as nothing more than a vehicle to impose a communist style government both in America, and world wide. These people are evil, nothing more and nothing less. There are several masters being served here by the Obama regime, and it’s disciples. First, there is the money, lots of money. The Obama regime, using the tenets of radical environmentalism, .which is based on a hoax, (global warming) to set up a cap and trade system that will see Obama, Al Gore, and many others rake in tens of trillions of dollars from people who are forced to purchase “carbon credits” through the Chicago Climate Exchange, which was created by Obama, and has among others, Al Gore, and elements of Goldman Sachs as partners. You can read more on The Greatest Swindle In Human History here and here. One thing we must also never forget, while Obama and his people are doing everything they can to shut down all energy production in America, last year, Barack Obama loaned Brazil $15 billion in order to drill off it’s own coast. How does that square with the Obama regime’s cries for a “cleaner planet“? Anyone really think Brazil would be more diligent than America on environmental safety? The real story here is the fact that three days before Obama gave Brazil the $15 billion tax payer dollars, his real boss, former Nazi sympathizer George Soros, purchased controlling interest in Petrobas, the Brazilian oil giant that will be using this gift of our money. It doesn’t take a brain surgeon to figure out who stands to make an obscene amount of money if America is no longer producing oil. Soros is one of the most evil men on the planet, and owns the Marxist-democrat party lock, stock and barrel. He funds hundreds of Marxist-democrat party organizations. It stands to reason they will help him add even more wealth to his bank account, since his groups are responsible for keeping the most corrupt President and the most corrupt political party in our nation’s history afloat. David Horowitz’s Discover The Networks has a profile on Soros here. So far, all we are seeing is massive corruption, and a cap and tax scheme that is so evil that Bernie Madoff would cry foul. All of this manipulation by the Obama regime, and the pushing of a proven hoax (global warming) is nothing more than a high end, Chicago Gangland Shakedown, on a global scale. For their part, the radical Marxists will get to witness the complete and total destruction of America, as well as the greatest redistribution of wealth in history. The real losers in all of this, are the poor misguided fools who actually care about the planet, and want to see it cared for responsibly. Absolutely nothing in Obama’s “green agenda” has to do with making the planet cleaner. The only green Obama and his fellow travelers care about is the kind of green that has dead presidents on the front. Unfortunately, the people who may actually care about the planet, have been indoctrinated in radical environmentalism and Marxist ideology for a generation. They have been taught to be closed minded and to have complete hatred for anything and everything that doesn’t fit the narrative. This is quite tragic, because there are people, who aren’t radical Marxists, that have the knowledge and skill to not only satisfy America’s need for energy, clean, inexpensive energy, that fuels our entire economy, but have a genuine love for our planet, and will go out of their way to do it right. They just aren’t devout followers of Karl Marx and Saul Alinsky. Sarah Palin is one of those people. She knows the oil and gas business as well as anyone out there. She worked to hold big oil accountable, and reform the system in Alaska. Sarah has first hand knowledge of what a disaster like the Gulf oil spill will do. As Governor, Sarah created an agency that was responsible for holding Big Oil responsible, and coming down hard when they weren’t. More importantly, she kept an eye on this commission, to make sure they did their job. It’s what a good CEO does. It’s ridiculous and quite dangerous for us to be drilling for oil so far off shore. Drilling in mile deep water isn’t just asking for trouble, it’s begging for it. If we were in shallower water, closer to land, this problem could have been more easily gotten under control, but the extreme depths radical environmentalists, and greedy, corrupt politicians have forced upon America, are the culprit here. Radical environmentalists loose heir mind when the talks turn to ANWR. Their media partners always aid them by running stories showing majestic eagles flying, polar bears looking all cuddly, and lush, green land. Now that may indeed represent some part of ANWR, but not where the oil is. Not where people want to drill. ANWR is roughly the size of the state of South Carolina. As Sarah points out, the spot where the oil is, is about the size of the Los Angeles International Airport. If you’re a Texan, think D-FW. International Airport. It truly is like comparing the size of a postage stamp, to the size of a football field. Also, the spot where the oil and natural gas are, is not all that nice. In the winter, it’s frozen tundra, that is barely inhabitable, and in the summer the most endearing features are the black flies and mosquitoes the size of a small bird! If you look on the map, there are already energy producing fields very close to this area. I remember when I was younger, the radical environmentalists lost their minds when planning for the Trans-Alaska pipeline was underway. The outrageous claims of devastation and destruction were just as over the top as what we see today. My goodness this was going to destroy the caribou. Now mind you, most Alaskan’s rely heavily on caribou and other game for their very survival. As Sarah puts it, “I eat, therefore I hunt.” This is very much the way of life in Alaska. Alaskan’s aren’t going to destroy their food supply. Long story short, as always, the environmental moonbats were wrong. It seems that the oil that comes through the pipeline is warm, even when the outside temps are well below zero. Caribou love the warmth. It also makes the caribou, and other game rather romantic. Instead of making the caribou extinct, these buggers multiplied like rabbits! So much for the wisdom of radical environmentalism. Several things need to happen here. One, we need competent leadership, from people that actually have an understanding of how stuff works. We need someone who is honest, and incorruptible. That of course, would be Sarah Palin, and those like her. We also must start investigating the massive lies and corruption that surround the so-called “green movement” as well as all of those involved with the Obama regime. Someone must have the guts to go after Obama, and all of the members of Crime, Inc. We also need someone with the guts to go after George Soros, and take this guy down. He is pure evil, and funds pure evil worldwide. The Marxist-democrats like Obama love to shout from the rooftops how evil capitalism is, and how we need “social and economic justice” to “make things right“, but under the shadow of darkness, these evil men work and scheme to find the best way to steal America, and the world, blind, making themselves rich beyond all imagination. In the end, all Obama and his fellow travelers really are, are just common criminals.